Life can certainly become full and some seasons are busier than others. During the midst of everything going on in life that you are juggling, it’s easy to forget the small things. Some of these small things, if left unattended, could become big hazards to your health your home. So what are these small details that should receive attention inspection on a regular basis? Appliances are at the top of the list! Households use a myriad of appliances on a daily basis. How often are they checked to make sure that they are turned off or unplugged? We’ll share a few practices that should become part of your daily routine. They are small tasks that won’t take long, but they could keep you and your family out of danger from these hazards! Let’s first address appliances, which are often used the most and emit a great deal of heat. These appliances include clocks, TV’s, computer monitors and other screens. Make sure that each one of the appliances in your home have enough space around them so that there’s no chance of overheating and touching something else, which could cause a fire. A few inches of space around each appliance should be enough space. It may seem like commonly known information to leave your appliances away from water. It’s important to also keep your electrical appliances away from any vents as well because these vents could potentially leak and cause a hazard. Now let’s talk power cords – when you use power cords to extend and reach lamps or lights, check for any kinks or frays in the cord. If there are any kinks, straighten them out. If there are any frays, replace the power cords all together. When using power cords, keep them out of the way and tucked under rugs or behind furniture so that they aren’t in the walkway. Instead of grabbing any power cord when you go to pick-up a new one, check the weight and length to make sure that you are purchasing the right power cord for its use. 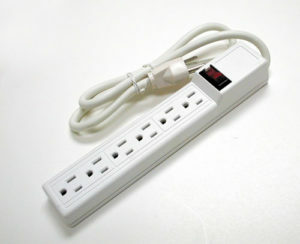 Avoid overloading outlets when using power strips – this could become a big hazard! When buying light bulbs for your home, also check to make sure that you are buying the appropriate wattage to the fixture you will be using it for. If you use a light bulb that has a higher wattage than the fixture calls for, this could cause a potential fire. Whenever you leave the home, check all appliances to make sure they are turned off and unplugged. It’s always important to make sure that your electrical panel is operating efficiently and safely. Call Central Carolina Air Conditioning, Plumbing & Electrical to perform a thorough scan throughout your home, looking for any hot spots in your electrical system. We will also test the ground fault outlets to make sure that they are functioning properly. This is especially important for any outlets near water or other hazards! Give us a call today Call to schedule your appointment today at 800-461-3010. Lighting is important to allow us to see and be able to live in our homes with a source of guidance and light. There’s another reason why light is important though. Let’s talk about ambiance and lighting! We spend the majority of our time in our homes, and the lighting plays an important role in creating a warmth and ambiance. The lighting should help fulfill a purpose or create a feeling that we desire for each room or space. You probably haven’t considered this and what the lighting in your home says about you. What kind of mood are you trying to create and capture for each room? Let’s talk about the different kinds of lighting and which lighting is best for each room. As you think about the purpose of each room, it’s easier to understand the lighting that fits best for that room. Accent Lighting – although every space in your home is probably well decorated and thought out, there are probably a couple spots that should receive extra attention and focus. These are the spots that you want to highlight with accent lighting like a bookshelf or painting. You could include accent lighting in rooms like your study or office. Task Lighting – do you have a project to work on or a book that you’re in the middle of reading? If so, this is a good time to break out the task lighting. You probably want a designated place in your home where you use task lighting. This lighting is the opposite of warmth and ambiance because it’s intended to keep you focused and alert. Task lighting is often bright as well. Task lighting is often used in the kitchen to provide extra visibility for areas like the counter tops. Track lights are typically used under counters to provide this extra lighting. Your library or office is also another good place to put task lighting and keep you focused and alert. General/Ambient Lighting – this type of lighting is typically known a room’s natural light. It brightens up the entire room. There a few different types of lights that can be put into this category. A few of the lights that fall into the category of general lighting are chandeliers, track lights and pendant lights. General lighting is often found in the kitchen where people often gather most and spend the majority of their time. The living room is another area of the home that needs general lighting. Ceiling lights are often used to provide this. A couple lamps can also be used to provide warm ambient lighting in the living room. When using any form of electricity, it’s always important to make sure that your electrical panel is operating efficiently and safely. Central Carolina Air Conditioning, Plumbing & Electrical can perform a thorough scan throughout your home, looking for any hot spots in your electrical system. We will also test the ground fault outlets to make sure that they are functioning properly. Are You Changing Your Air Filters? Life often gets hectic, and it’s hard enough to keep up with all the regular household chores like dusting and mopping. Have you given much thought to your air filters? They should be changed out routinely every month. This reminder shouldn’t be taken lightly, because there are many benefits to cleaning out your filters! We will highlight the benefits of routinely changing your air filters, and also provide a list of the different air filter options available! Your health is the most important reason why you should change your air filters. The accumulation of dust and pollen circulate the air and get filtered back into your home and the air you breathe if these filters are not routinely changed. If anyone in your home has asthma or allergies, this is even more of a reason to change your filters to get rid of the contaminants that fill the air so that you and your family can breathe fresh air in your home! Less stress on your air conditioner should also be a motivating factor to remember to pay attention to your air filters every month. Over time, as your filters build up with contaminates, it puts more stress on your AC unit and requires it to work harder to circulate air and it expends more energy to adjust the temperature of your home. Over time, this added stress on your AC unit will put wear and tear on it and limit the lifespan of your unit. The final motivating factor that should prompt you to change your filters is the idea of a lower utility bill. By keeping consistently fresh filters in your home, you will lower your utility bills by saving energy! So what about the filter types that are offered in stores today? Pleated Media Filters – these filters gather more particles and are efficient at capturing more of the particles because of the increased surface area of the filter. HEPA Filters – they offer the overall highest air quality control. Many HVAC Systems don’t allow the option to accommodate these types of filters. If you are interested in achieving this high level of air quality in your home, you may want to call a professional to retrofit your furnace to accommodate these filters. Flat-paneled Fiberglass Air Filters – these types of filters have a fiberglass disposable filter. They are an inexpensive option, however they come with a tradeoff by providing a lower quality of air in your home since they don’t clean the air as well as the other filter options. Washable Air Filters – these are a more costly option, and will require some additional maintenance if you’re up for it! You have to allow adequate time for them to dry when cleaning them. There are a few essential parts to your AC unit that require regular tune-ups. Central Carolina Air Conditioning, Plumbing & Electrical can provide routine maintenance on your Air Conditioning unit and we can also change out air filters during our air conditioning tune ups! We will help you save money in the long run and ensure your unit is running more efficiently! In a previous post, we addressed the dangers that can come from dryer fires and why it’s important to take preventative measures and keep your home and family safe. It’s equally important to have surge protection in your home to protect your home from electrical hazards. Society has evolved over the past several years and there are more technological pieces per household than there have ever been before. With this comes a great chance of surges happening because each electronic often comes with a circuit board. If you have a device or appliance that isn’t dedicated to a circuit but is connected with other devices, there’s a potential problem. If that device sends a surge through that circuit, the other outlets from the shared devices could also be susceptible to a surge. This is one reason to get surge protection in your whole home. Instead of getting a surge protector at the electrical panel, it’s a good idea to consider getting a surge protector at the point of use to help protect electronics that are especially sensitive. If you have a whole home entertainment system or home theater, power conditioners with surge suppression capability are the best route. They provide power through a filtered system to your video and audio equipment. You don’t want to buy just any surge protector – make sure you’re getting the right one for your home. Many homes have 120V service. If this is the same for your home, then an 80kA rated surge protector should be adequate. The reason why is because it’s unlikely for a home to surge over 10kA, so many homes will be covered and protected with the 80kA rated surge protector. Of course it’s important for you to verify which your home is and what’s the best protector for your appliances and systems. You’ll also want to pay attention to the nominal discharge rating for your surge protectors. Ratings should be 3, 5 or 10KA. This rating is important because it indicates the ability to weather through high energy waves respectively over time and still operate optimally. The Voltage Protection Rating should also be considered when purchasing a surge protector. This represents that amount of voltage that the surge protector allows to pass through it. For this rating, you’ll want to have lower numbers such as 500V to 600V. Surge protectors should be replaced annually to make sure you’re your electronics are protected.